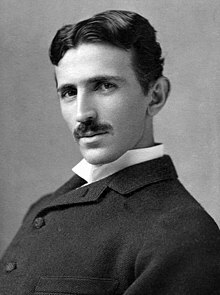 Tesla gained experience in telephony and electrical engineering before immigrating to the United States in 1884 to work for Thomas Edison in New York City. He soon struck out on his own with financial backers, setting up laboratories and companies to develop a range of electrical devices. His patented AC induction motor and transformer were licensed by George Westinghouse, who also hired Tesla for a short time as a consultant. His work in the formative years of electric power development was involved in a corporate alternating current/direct current "War of Currents" as well as various patent battles. Tesla went on to pursue his ideas of wireless lighting and electricity distribution in his high-voltage, high-frequency power experiments in New York and Colorado Springs and made early (1893) pronouncements on the possibility of wireless communication with his devices. He tried to put these ideas to practical use in his ill-fated attempt at intercontinental wireless transmission, which was his unfinished Wardenclyffe Tower project. In his lab he also conducted a range of experiments with mechanical oscillators/generators, electrical discharge tubes, and early X-ray imaging. He also built a wireless controlled boat, one of the first ever exhibited. Tesla was renowned for his achievements and showmanship, eventually earning him a reputation in popular culture as an archetypal "mad scientist." His patents earned him a considerable amount of money, much of which was used to finance his own projects with varying degrees of success. :121,154 He lived most of his life in a series of New York hotels, through his retirement. He died on 7 January 1943. His work fell into relative obscurity after his death, but in 1960 the General Conference on Weights and Measures named the SI unit of magnetic flux density the tesla in his honor. Tesla has experienced a resurgence in interest in popular culture since the 1990s. Tesla wearing a folk costume, c. 1880. Rebuilt, Tesla's house (parish hall) in Smiljan, Croatia, where he was born, and the rebuilt church, where his father served. 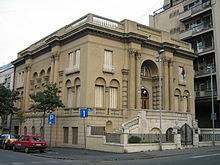 During the Yugoslav Wars, several of the buildings were severely damaged by fire. They were restored and reopened in 2006. Tesla's baptismal record, 28 June 1856. 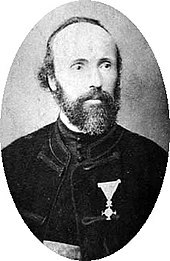 Nikola Tesla's father Milutin, Orthodox priest in the village of Smiljan. On 24 March 1879, Tesla was returned to Gospić under police guard for not having a residence permit. On 17 April 1879, Milutin Tesla died at the age of 60 after contracting an unspecified illness (although some sources say that he died of a stroke). During that year, Tesla taught a large class of students in his old school, Higher Real Gymnasium, in Gospić. In 1882, Tesla began working for the Continental Edison Company in France, designing and making improvements to electrical equipment. In June 1884, he relocated to New York City:57–60 where he was hired by Thomas Edison to work for his Edison Machine Works. Tesla's work for Edison began with simple electrical engineering and quickly progressed to solving more difficult problems. Tesla was offered the task of completely redesigning the Edison Company's direct current generators. In 1885, he said that he could redesign Edison's inefficient motor and generators, making an improvement in both service and economy. According to Tesla, Edison remarked, "There's fifty thousand dollars in it for you—if you can do it":54–57—this has been noted as an odd statement from an Edison whose company was stingy with pay and who did not have that sort of cash on hand. :110 After months of work, Tesla fulfilled the task and inquired about payment. Edison, saying that he was only joking, replied, "Tesla, you don't understand our American humor. ":64 Instead, Edison offered a US$10 a week raise over Tesla's US$18 per week salary; Tesla refused the offer and immediately resigned. The investors showed little interest in Tesla's ideas for new types of motors and electrical transmission equipment and also seemed to think it was better to develop an electrical utility than invent new systems. They eventually forced Tesla out leaving him penniless. He even lost control of the patents he had generated since he had assigned them to the company in lieu of stock. He had to work at various electrical repair jobs and even as a ditch digger for $2 per day. Tesla considered the winter of 1886/1887 as a time of "terrible headaches and bitter tears." During this time, he questioned the value of his education. Nikola Tesla's AC dynamo-electric machine (AC Electric generator) in an 1888 U.S. Patent 390,721. In July 1888, Brown and Peck negotiated a licensing deal with George Westinghouse for Tesla's polyphase induction motor and transformer designs for $60,000 in cash and stock and a royalty of $2.50 per AC horsepower produced by each motor. Westinghouse also hired Tesla for one year for the large fee of $2,000 ($52,500 in today's dollars) per month to be a consultant at the Westinghouse Electric & Manufacturing Company's Pittsburgh labs. Tesla's demonstration of his induction motor and Westinghouse's subsequent licensing of the patent, both in 1888, put Tesla firmly on the "AC" side of the so-called "War of Currents," an electrical distribution battle being waged between Thomas Edison and George Westinghouse that had been simmering since Westinghouse's first AC system in 1886 and had reached the point of all out warfare by 1888. This started out as a competition between rival lighting systems with Edison holding all the patents for DC and the incandescent light and Westinghouse using his own patented AC system to power arc lights as well as incandescent lamps of a slightly different design to get around the Edison patent. The acquisition of a feasible AC motor gave Westinghouse a key patent in building a completely integrated AC system, but the financial strain of buying up patents and hiring the engineers needed to build it meant development of Tesla's motor had to be put on hold for a while. The competition resulted in Edison Machine Works pursuing AC development in 1890 and by 1892 Thomas Edison was no longer in control of his own company, which was consolidated into the conglomerate General Electric and converting to an AC delivery system at that point. 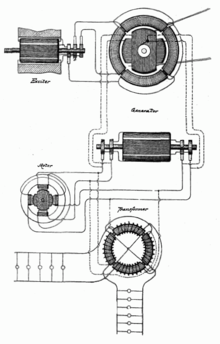 At the beginning of 1893 Westinghouse engineer Benjamin Lamme had made great progress developing an efficient version of Tesla's induction motor and Westinghouse Electric started branding their complete polyphase phase AC system as the "Tesla Polyphase System", noting how they believed Tesla's patents gave them patent priority over other AC systems. Within the room was suspended two hard-rubber plates covered with tin foil. These were about fifteen feet apart, and served as terminals of the wires leading from the transformers. When the current was turned on, the lamps or tubes, which had no wires connected to them, but lay on a table between the suspended plates, or which might be held in the hand in almost any part of the room, were made luminous. These were the same experiments and the same apparatus shown by Tesla in London about two years previous, "where they produced so much wonder and astonishment". In 1893 Richard Dean Adams, who headed up the Niagara Falls Cataract Construction Company sought Tesla's opinion on what system would be best to transmit power generated at the falls. Over several years there had been an off again - on again series of proposals and open competitions on how best to utilize power generated by the falls with many systems being proposed by several US and European companies including two phase and three phase AC, high voltage DC, and even compressed air. Adams pumped Tesla for information about the current state of all the competing systems, with Tesla advised Adams that a two phased system would be the most reliable and that there was a Westinghouse system to light incandescent bulbs using two phase alternating current. Based on Tesla's advice and Westinghouses demonstration that they could build a complete AC system at the Colombian Exposition, a contract for building a two phase AC generating system at the Niagara Falls was awarded to Westinghouse Electric. A further contract to build the AC distribution system was awarded to General Electric.. 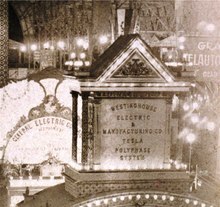 The mid 1890s saw the conglomerate General Electric, backed by financier J. P. Morgan, involved in take over attempts and patent battles with Westinghouse Electric. Although a patent sharing agreement was signed between the two companies in 1896 Westinghouse was still cashed strapped from the financial warfare. To secure further loans Westinghouse was forced to revisit Tesla's AC patent, which bankers considered a financial strain on the company (at that point Westinghouse had paid out an estimated $200,000 in licenses and royalties to Tesla, Brown, and Peck). In 1897, Westinghouse explained his financial difficulties to Tesla in stark terms, saying that if things continue the way they were he would no longer be in control of Westinghouse Electric and Tesla would have to "deal with the bankers" to try to collect future royalties. Westinghouse convinced Tesla to release his company from the licensing agreement over Tesla's AC patents in exchange for Westinghouse Electric purchasing the patents for a lump sum payment of $216,000;:73–74 this provided Westinghouse a break from what, due to alternating current's rapid gain in popularity, had turned out to be an overly generous $2.50 per AC horsepower royalty. On 30 July 1891, at the age of 35, Tesla became a naturalized citizen of the United States, and established his South Fifth Avenue laboratory, and later another at 46 E. Houston Street, in New York. He lit electric lamps wirelessly at both locations, demonstrating the potential of wireless power transmission. In the same year, he patented the Tesla coil. Tesla served as vice president of the American Institute of Electrical Engineers, the forerunner (along with the Institute of Radio Engineers) of the modern-day IEEE, from 1892 to 1894. 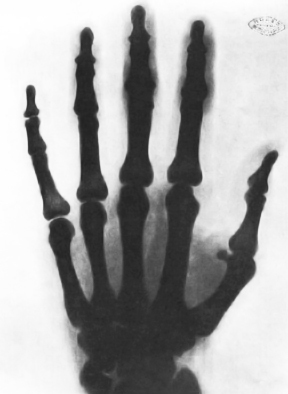 X-ray of a hand taken by Tesla. Wireless transmission of power and energy demonstration during his 1891 lecture on high frequency and potential. On 17 May 1899, Tesla moved to Colorado Springs, where he would have room for his high-voltage, high-frequency experiments; his lab was located near Foote Ave. and Kiowa St. He chose this location because the polyphase alternating current power distribution system had been introduced there and he had associates who were willing to give him all the power he needed without charging for it. Upon his arrival, he told reporters that he was conducting wireless telegraphy experiments, transmitting signals from Pikes Peak to Paris. The 1978 book Colorado Springs Notes, 1899–1900 contains descriptions of Tesla's experiments. While experimenting, Tesla inadvertently faulted a power station generator, causing a power outage. In August 1917, Tesla explained what had happened in The Electrical Experimenter: "As an example of what has been done with several hundred kilowatts of high frequency energy liberated, it was found that the dynamos in a power house six miles away were repeatedly burned out, due to the powerful high frequency currents set up in them, and which caused heavy sparks to jump through the windings and destroy the insulation!" An Alley Colorado Springs photo of a grounded tuned coil in resonance with a transmitter illuminates a light near the bottom of the picture. Tesla did not disclose how far away the transmitter was. During his time at his lab, Tesla observed unusual signals from his receiver which he concluded may be communications from another planet. He mentioned them in a letter to reporter Julian Hawthorne at the Philadelphia North American on 8 December 1899 and in a December 1900 letter about possible discoveries in the new century to the Red Cross Society where he referred to messages "from another world" that read "1... 2... 3...". Reporters treated it as a sensational story and jumped to the conclusion Tesla was hearing signals from Mars. He expanded on the signals he heard in a 9 February 1901 Collier's Weekly article "Talking With Planets" where he said it had not been immediately apparent to him that he was hearing "intelligently controlled signals" and that the signals could come from Mars, Venus, or other planets. It has been hypothesized that he may have intercepted Marconi's European experiments in July 1899—Marconi may have transmitted the letter S (dot/dot/dot) in a naval demonstration, the same three impulses that Tesla hinted at hearing in Colorado—or signals from another experimenter in wireless transmission. On 7 January 1900, Tesla left Colorado Springs. His lab was torn down in 1904, and its contents were sold two years later to satisfy a debt. In 1900, with $150,000 ($4,252,200 in today's dollars; 51% from J. Pierpont Morgan), Tesla began planning the Wardenclyffe Tower facility. In December 1901, Marconi successfully transmitted the letter S from England to Newfoundland, terminating Tesla's relationship with Morgan. [improper synthesis?] Over the next five years, Tesla wrote over 50 letters to Morgan, pleading for and demanding additional funding to complete the construction of Wardenclyffe. Tesla continued the project for another nine months. The tower was erected to its full 187 feet (57 m). In July 1903, Tesla wrote to Morgan that in addition to wireless communication, Wardenclyffe would be capable of wireless transmission of electric power. On 14 October 1904, Morgan finally replied through his secretary, stating, "It will be impossible for [me] to do anything in the matter," after Tesla had written to Morgan when the financier was meeting with the Archbishop of Canterbury in an attempt to appeal to his Christian spirit. Tesla invented a steam-powered mechanical oscillator—Tesla's oscillator. While experimenting with mechanical oscillators at his Houston Street lab, Tesla allegedly generated a resonance of several buildings. As the speed grew, it is said that the machine oscillated at the resonance frequency of his own building and, belatedly realizing the danger, he was forced to use a sledge hammer to terminate the experiment, just as the police arrived. :162–164 In February 1912, an article—"Nikola Tesla, Dreamer" by Allan L. Benson—was published in World Today, in which an artist's illustration appears showing the entire earth cracking in half with the caption, "Tesla claims that in a few weeks he could set the earth's crust into such a state of vibration that it would rise and fall hundreds of feet and practically destroy civilization. A continuation of this process would, he says, eventually split the earth in two." Tesla theorized that the application of electricity to the brain enhanced intelligence. In 1912, he crafted "a plan to make dull students bright by saturating them unconsciously with electricity," wiring the walls of a schoolroom and, "saturating [the schoolroom] with infinitesimal electric waves vibrating at high frequency. The whole room will thus, Mr. Tesla claims, be converted into a health-giving and stimulating electromagnetic field or 'bath.'" The plan was, at least provisionally approved by then superintendent of New York City schools, William H. Maxwell. Before World War I, Tesla sought overseas investors. After the war started, Tesla lost the funding he was receiving from his patents in European countries. Eventually, he sold Wardenclyffe for $20,000 ($470,900 in today's dollars). In 1917, around the time that the Wardenclyffe Tower was demolished by Boldt to make the land a more viable real estate asset, Tesla received AIEE's highest honor, the Edison Medal. Starting in 1934, the Westinghouse Electric & Manufacturing Company began paying Tesla $125 per month as well as paying his rent at the Hotel New Yorker, expenses the Company would pay for the rest of Tesla's life. Accounts on how this came about vary. Several sources say Westinghouse was worried about potential bad publicity surrounding the impoverished conditions their former star inventor was living under. :365 It has been described as being couched in the form of a "consulting fee" to get around Tesla's aversion to accept charity, or by one biographer (Marc Seifer), as a type of unspecified settlement. In the fall of 1937, after midnight one night, Tesla left the Hotel New Yorker to make his regular commute to the cathedral and the library to feed the pigeons. While crossing a street a couple of blocks from the hotel, Tesla was unable to dodge a moving taxicab and was thrown heavily to the ground. Tesla's back was severely wrenched and three of his ribs were broken in the accident (the full extent of his injuries will never be known; Tesla refused to consult a doctor—an almost lifelong custom). Tesla didn't raise any question as to who was at fault and refused medical aid, only asking to be taken to his hotel via cab. Tesla was bedridden for some months and was unable to continue feeding pigeons from his window; soon, they failed to come. In the spring of 1938, Tesla was able to get up. He at once resumed the pigeon-feeding walks on a much more limited scale, but frequently had a messenger act for him. During the period in which the negotiations were being carried on, Tesla said that efforts had been made to steal the invention. His room had been entered and his papers had been scrutinized, but the thieves, or spies, left empty-handed. He said that there was no danger that his invention could be stolen, for he had at no time committed any part of it to paper. The blueprint for the teleforce weapon was all in his mind. 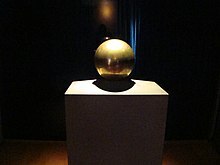 Gilded urn with Tesla's ashes, in his favorite geometrical object, a sphere, Nikola Tesla Museum, Belgrade. On 7 January 1943, Tesla, 86, died alone in room 3327 of the New Yorker Hotel. His body was later found by maid Alice Monaghan after she had entered Tesla's room, ignoring the "do not disturb" sign that Tesla had placed on his door two days earlier. Assistant medical examiner H.W. Wembly examined the body and ruled that the cause of death had been coronary thrombosis. Tesla's remains were taken to the Frank E. Campbell Funeral Home at Madison Ave. and 81st St. A long-time friend and supporter of Tesla, Hugo Gernsback, commissioned a sculptor to create a death mask, now displayed in the Nikola Tesla Museum. In a box purported to contain a part of Tesla's "death ray," Trump found a 45-year-old multidecade resistance box. On 10 January 1943, New York City mayor Fiorello La Guardia read a eulogy written by Slovene-American author Louis Adamic live over the WNYC radio while violin pieces "Ave Maria" and "Tamo daleko" were played in the background. On 12 January 2,000 people attended a state funeral for Tesla at the Cathedral of Saint John the Divine. After the funeral, Tesla's body was taken to the Ferncliff Cemetery in Ardsley, New York, where it was later cremated. The following day, a second service was conducted by prominent priests in the Trinity Chapel (today's Serbian Orthodox Cathedral of Saint Sava) in New York City. Tesla obtained around 300 patents worldwide for his inventions. Some of Tesla's patents are not accounted for, and various sources have discovered some that have lain hidden in patent archives. There are a minimum of 278 patents issued to Tesla in 26 countries that have been accounted for. Many of Tesla's patents were in the United States, Britain, and Canada, but many other patents were approved in countries around the globe. :62 Many inventions developed by Tesla were not put into patent protection. For exercise, Tesla walked between 8 to 10 miles per day. He squished his toes one hundred times for each foot every night, saying that it stimulated his brain cells. Tesla's portrait – Blue Portrait – from 1916, painted by then-Hungarian princess, Vilma Lwoff-Parlaghy. Tesla was 6 ft 2 in (1.88 m) tall and weighed 142 pounds (64 kg), with almost no weight variance from 1888 to about 1926.:292 He was an elegant, stylish figure in New York City, meticulous in his grooming, clothing, and regimented in his daily activities. Tesla read many works, memorizing complete books, and supposedly possessed a photographic memory. :33 He was a polyglot, speaking eight languages: Serbo-Croatian, Czech, English, French, German, Hungarian, Italian, and Latin. :282 Tesla related in his autobiography that he experienced detailed moments of inspiration. During his early life, Tesla was stricken with illness time and time again. He suffered a peculiar affliction in which blinding flashes of light would appear before his eyes, often accompanied by visions. Often, the visions were linked to a word or idea he might have come across; at other times they would provide the solution to a particular problem he had encountered. Just by hearing the name of an item, he would be able to envision it in realistic detail. Tesla claimed to never sleep more than two hours. :46 However, Tesla did admit to "dozing" from time to time "to recharge his batteries." Kenneth Swezey, a journalist whom Tesla had befriended, confirmed that Tesla rarely slept. Swezey recalled one morning when Tesla called him at 3 a.m.: "I was sleeping in my room like one dead ... Suddenly, the telephone ring awakened me ... [Tesla] spoke animatedly, with pauses, [as he] ... work[ed] out a problem, comparing one theory to another, commenting; and when he felt he had arrived at the solution, he suddenly closed the telephone." Tesla never married, saying that his chastity was very helpful to his scientific abilities. :33 However, toward the end of his life, he told a reporter, "Sometimes I feel that by not marrying, I made too great a sacrifice to my work ..." There have been numerous accounts of women vying for Tesla's affection, even some madly in love with him. Tesla, though polite and soft-spoken, did not have any known relationships. Tesla was asocial, and prone to seclude himself with his work. However, when he did engage in a social life, many people spoke very positively and admiringly of Tesla. Robert Underwood Johnson described him as attaining a "distinguished sweetness, sincerity, modesty, refinement, generosity, and force." His loyal secretary, Dorothy Skerrit, wrote: "his genial smile and nobility of bearing always denoted the gentlemanly characteristics that were so ingrained in his soul." Tesla's friend, Julian Hawthorne, wrote, "seldom did one meet a scientist or engineer who was also a poet, a philosopher, an appreciator of fine music, a linguist, and a connoisseur of food and drink." Tesla was a good friend of Robert Underwood Johnson, Francis Marion Crawford, Stanford White, Fritz Lowenstein, George Scherff, and Kenneth Swezey. In middle age, Tesla became a close friend of Mark Twain. They spent a lot of time together in his lab and elsewhere. Twain notably described Tesla's induction motor invention as "the most valuable patent since the telephone." In the late 1920s, Tesla befriended George Sylvester Viereck, a poet, writer, mystic, and later, a Nazi propagandist. Tesla occasionally attended dinner parties held by Viereck and his wife. Tesla exhibited a pre-atomic understanding of physics in his writings; he disagreed with the theory of atoms being composed of smaller subatomic particles, stating there was no such thing as an electron creating an electric charge (he believed that if electrons existed at all, they were some fourth state of matter or "sub-atom" that could only exist in an experimental vacuum and that they had nothing to do with electricity). :249 Tesla believed that atoms are immutable—they could not change state or be split in any way. He was a believer in the 19th century concept of an all pervasive "ether" that transmitted electrical energy. Tesla was raised as an Orthodox Christian. Later in his life, he did not consider himself to be a "believer in the orthodox sense," and opposed religious fanaticism. Despite this, he had a profound respect for both Buddhism and Christianity. Tesla on cover of Time Magazine for 20 July 1931. Tesla's legacy has endured in books, films, radio, TV, music, live theater, comics and video games. The lack of recognition received during his own lifetime has cast him as a tragic and inspirational character, well suited to dramatic fiction. The impact of the technologies invented or envisioned by Tesla is a recurring theme in several types of science fiction. For example, on Tesla's 75th birthday in 1931, Time magazine put him on its cover. The cover caption "All the world's his power house" noted his contribution to electrical power generation. He received congratulatory letters from more than 70 pioneers in science and engineering, including Albert Einstein. Tesla, an electrotechnical conglomerate in the former Czechoslovakia. In 2008, a total of 128 streets in Croatia were named after Nikola Tesla, making him the eighth most common person eponym of streets in the country. On 7 July 2006, on the corner of Masarykova and Preradovićeva streets in the Lower Town area in Zagreb, Croatia, a monument of Tesla was unveiled. This monument was designed by Ivan Meštrović in 1952 and was transferred from the Zagreb-based Ruđer Bošković Institute where it had spent previous decades. In 2012, Jane Alcorn, president of the nonprofit group Tesla Science Center at Wardenclyffe, and Matthew Inman, creator of web cartoon The Oatmeal, raised a total of $2,220,511 – $1,370,511 from a campaign and $850,000 from a New York State grant—to buy the property where Wardenclyffe Tower once stood and eventually turn it into a museum. The group began negotiations to purchase the Long Island property from Agfa Corporation in October 2012. The purchase was completed in May 2013.